Football player, coach, artist, and actor—William Lone Star Dietz played each of these roles during his long, celebrated career, and in each of these personas he found success. Questions from the hazy background of Lone Star’s early life revolve around his parentage. His father came to Rice Lake, Wisconsin in 1871 with his German parents, and married a Caucasian woman. Billy was born in 1884, but his birth certificate wasn’t signed for five years. Billy heard his parents discussing his Indian blood, and was told that his real mother lived “a long, long way” away. While it was never proven that he was part Sioux, Billy obviously believed it—he adopted his Indian name from a reputed uncle, enrolled in Indian schools, and dressed in Indian regalia throughout his life. Surprisingly, it is Lone Star’s artistic endeavors, not his gridiron prowess, that help the author (a teacher with a PhD in Mathematics Education) sort out his subject’s poorly documented adolescent years. Lone Star drew illustrations for student literary publications in Minnesota, Oklahoma, and Kansas. At Carlisle Indian School in Pennsylvania, Lone Star made his mark as an artist and football player. He enrolled there in 1907, and played under the tutelage of Glenn “Pop” Warner. In 1912 he hired on as Warner’s assistant, and with Jim Thorpe just back from the Olympics, Carlisle scored more points than any other team in the country. Lone Star’s art career flourished, and he and his new wife, the Indian artist Angel DeCora, illustrated several books together. Rumors of recruiting improprieties led to the de-emphasis of sports at, and when “Pop” Warner left Carlisle in 1915, that was “the end of the trail for Carlisle football.” Lone Star moved on to coach at Washington State College, where his first season culminated in the 1916 Rose Bowl, officially putting “West Coast football on the college football map.” When he was indicted on draft evasion charges, Lone Star was fired, and took a series of low-profile jobs with lesser schools. Forced into early retirement by the WWII recess in college football, Dietz lived in near-poverty until his death in 1964. It is said he had “Keep A-Goin’,” a poem by his friend and mentor “Pop” Warner, in his hands when he died. The author spent five years travelling to Deitz’s many habitats in pursuit of this many-layered saga. 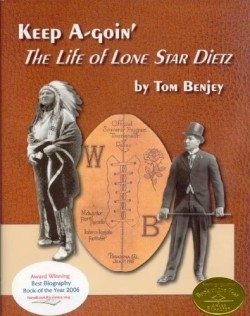 Lone Star’s story has been explored before—from a 1912 article by a Carlisle publicist to a recent biography of Angel DeCora—but none has been as meticulously documented as this one, or as replete with the spirited details of Dietz’s football expertise, on the field and the sidelines. This foray into his life and times provides rich fodder not only for sports buffs, but also for students of Native American studies.